This humidity is caused mainly by the use of modern non-breathable materials in an old house that wasn’t designed to be airtight, and that is made of materials that work by absorbing and then expelling moisture, often referred to as ‘breathing’. Rubber underlay appears to be the main culprit in The Lodge's case, along with a host of secondary offenders: where foil-backed ‘damp-proof’ wallpaper has been used; some areas where the original lime plaster has been replaced/repaired with gypsum plaster; at least one area where this new gypsum plaster has been given some kind of damp proof backing; UPVC double-glazed windows, complete with Sellotape over the vents; and an area of concrete flooring. Our primary objective as soon as we get the keys will be to ventilate the house – throw open all the windows and get rid of that rubber underlay, not to mention the manky carpet! Something that Pete, our surveyor, recommended was to get a hygrometer – an instrument to measure the relative humidity of the atmosphere in The Lodge. Mortgage and damp surveyors in particular commonly measure ‘damp’ in buildings using an electrical conductance moisture meter. These are recognisable by their two prongs, and were designed to measure the level of moisture in timber. This means that when used on other materials, such as plaster, they can only register the existence of surface moisture, and can’t determine the moisture content beyond the surface, i.e. in the wall itself. A hygrometer on the other hand measures the water vapour in the atmosphere, usually caused by condensation and evaporation. My parents had popped over during the survey day to have a look at the house, and my dad happened to have a hygrometer in his pocket, as you do. The Lodge registered around 75% relative humidity – something that didn’t come as a massive surprise given the amount of condensation-related mould around the house. Dad also produced an electrical conductance moisture meter and checked a joist in the floor upstairs. It registered ‘dry as a bone’. It’ll be interesting to see what the mortgage valuation surveyors report. Meanwhile we’ve bought a hygrometer of our own, and will use it to keep an eye on our progress. I wanted a simple, non-digital version, so I read a slew of reviews online and decided to stump up £15 for a German-made (by TFA-Dostmann) version. There are various different types of hygrometer, but the one we've bought is a mechanical version. This type is based on one of the first hygrometers ever designed, back in 1783 by Horace Bénédict de Saussure. It uses a synthetic hair (the original versions would have used organic hair) that expands and contracts in reaction to the humidity in its surrounding environment. The hair is held under tension by a spring, and this spring is linked to the needle gauge that you see. Bumps can disrupt the measurement, so as it arrived by post, the first thing we did was ‘reset’ it by wrapping it in a wet towel and leaving it for half an hour. At this point the hygrometer measures 100% humidity and is ‘reset’. To use it you simply put it in a normal room, away from direct light and heat sources, and let it acclimatise. I suspect I might get a bit obsessed checking our hygrometer in The Lodge, as we try to beat the problems we're inheriting. Condensation appears on walls when the temperature of the walls is at or below the dew point – the temperature that water vapour in the air condenses into liquid water. As this is directly affected by the humidity of the atmosphere, along with reducing the humidity, warming up The Lodge itself will be another thing high on the to-do list. If graphs and calculations aren't your thing, you can also buy digital hygrometers with a dew point indicator built in, like this one: TFA-Dostmann Digital Hygrometer with dew point indicator. 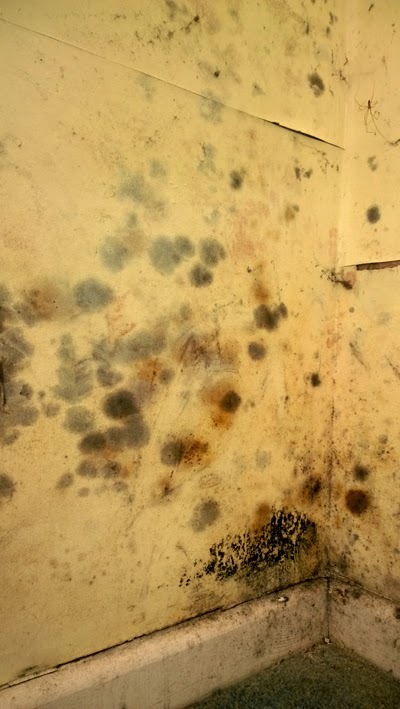 Meanwhile, if you’re keen to read even more about condensation, here’s an article by Pete, about condensation in old buildings. And if you just want to get rid of mould, click here for our recommendation.